Tesla Livestream of 2015 4. Auto Shareholder Meeting notes and observations 7.13. Head over to Tesla’s IR Website to follow along the livestream of the yearly shareholder meeting. We’ll be jotting down notes here of information of interest. 1. Shareholder doesn’t like leather. Doesn’t think the non-leather option is enough. 2. Full autopilot will hit some customers by end of the month. Elon says he has been testing the latest builds of Autopilot on his own vehicle. 3. 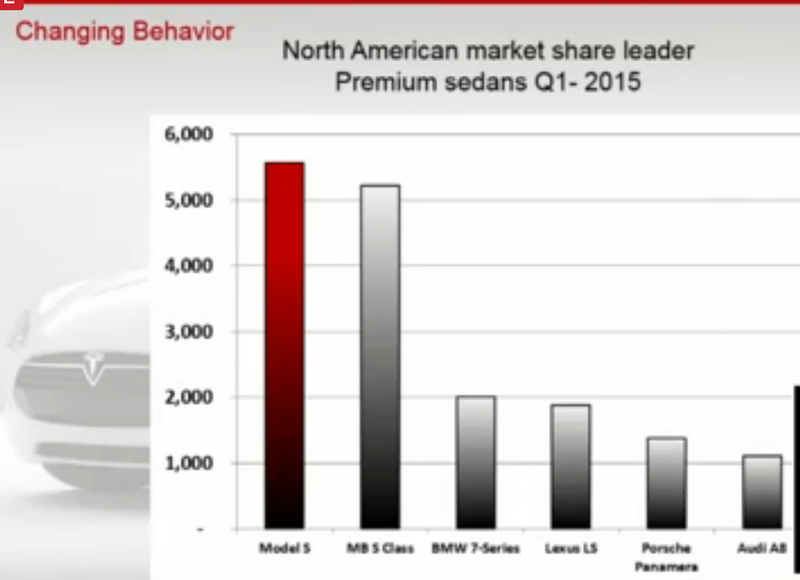 Model S is now the share leader of premium sedan market. 4. Next gen Supercharger cables are liquid cooled. 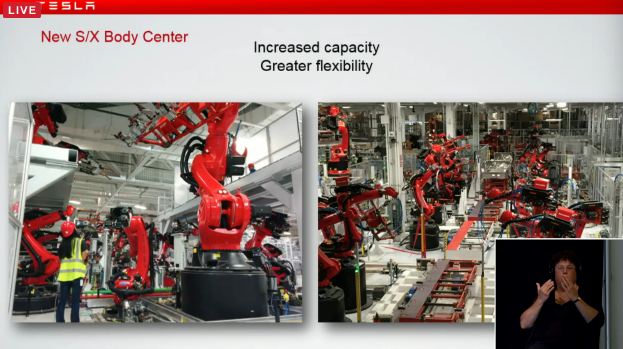 Will allow for more flexible cables and more powerful Superchargers in the future. 5. Powerwall power output doubled to 7kW. Price will not change. 6. Customers will be able to purchase and install the Powerwall for $4000. Doesn’t appear to include inverter cost. 7. New Casting/Machining Center and S/X Body Centers Installed. 8. New paint center will do 10,000 cars per week. Elon thinks it will be the most advanced paint shop in the world. 9. 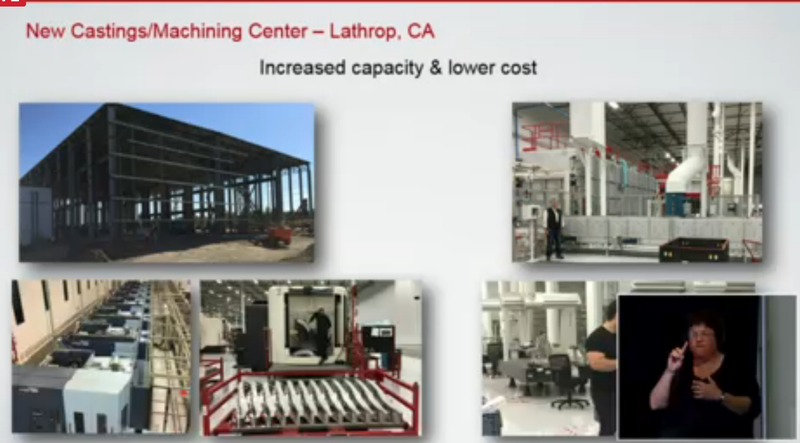 Gigafactory will be producing battery packs by the middle of next year. 10. CFO Deepak Ahuja retiring this year. Elon thanking him for everything he’s done for the company. 12. Talking about Gigafactories. Building more gigafactories not a priority just yet. 14. Elon: In most places in the US, the Powerwall doesn’t make as much economic sense because most utility customers pay close to a flat rate for power. Different story overseas. 15. Majority of battery sales will be Powerpack sales to utilities and large industrial customers. 16. You could take half of all the power plants in the world and turn them off if you had batteries. 17. Powerpacks are compact enough to fit in existing substations. “Turnkey solution” for corporate customers. 18. 10th Grader bought an 85D to use as a rental business in NV. Asking Elon about Autopilot. 19. Elon: We’d want Autopilot to be 10x safer than human drivers before allowing fully self-driving capabilities. 20. Another shareholder asking about auto-steering and if there are government hurdles. 21. Elon: I’m cautiously optimistic that we’ll have Autopilot to early access customers by the end of this month. No issues with government since auto-steer is a driver aid. 22. PETA representative complaining about the chemicals used in tanning leather. Would like to connect Tesla to companies producing leather alternatives. 23. Shareholder asking if AWD will be standard in future. 24. Elon: Model 3 base model will be single motor. Necessary to keep entry cost down. Dual motor will be an option. 24. Shareholder asking if Elon will take SpaceX public. 25. Elon: SpaceX will go public once we have regular flights to Mars. 27. Model S Injury rate likely lowest of any car. 28. Model X will have lowest probability of injury of any SUV. 29. As of 2 pm today, billionth Model S mile driven. 30. Shareholder asking about battery swap. 31. Elon: We’re seeing a very low take rate. Only 4 or 5 people wanted to participate out of the initial invitation list. They all swapped only once. Similar results when we opened it up to everyone. People don’t car about pack swap. The superchargers are fast enough. It’s unlikely to be something that’s worth expanding in the future unless we see changes. 32. Supercharging is “free long distance.” There are quite a few people using Superchargers quite aggressively. (It looks like Elon isn’t happy with this trend). 33. Shareholder asking how long until fully self-driving car. 34. Elon: It will be technically possible in approximately 3 years. It will take some time after that for regulators to accept it being okay for one to fall asleep in a self-driving vehicle. 1-3 years after that until regulators approve it, but that’s not under my control. 35. Shareholder asking about what Tesla is doing to inspire/help/educate future engineers. 36. Elon: We build cool cars that require engineering.